Karl Schwiesow explores the physical and conceptual pairing of ceramic sculpture and found utilitarian objects. He pursues interactions in which these elements seem to contradict one other and at the same time are necessary to their overall cohesion. Taking note of the original function and concept of objects, he deconstructs and reconstructs vernacular through abstractions and associations. 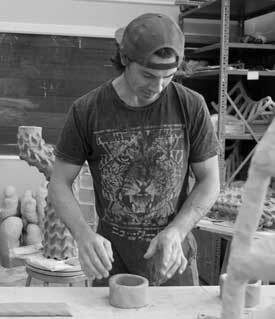 Karl received his MFA from the University of Montana, Missoula, in 2017, and his BFA from Sierra Nevada College, Nevada, in 2012. He has been an artist in residence at the Sonoma Community Center in Sonoma, CA, and at the Red Lodge Clay Center in Red Lodge, MT.